You are here: Home / DIY / Baby Shower Bootie Decoration! T’s Tips About Everything! Baby Shower Bootie Decoration! Today’s project is very simple. You will literally need only a handful of items. You will need a condiment cup, 3 cotton balls, tissue paper, and a ribbon of your choice. I did mine in all white but you can use any colors you want. 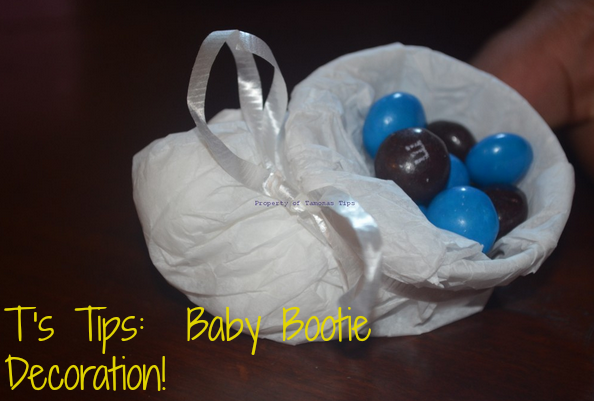 I use this method to make these booties for baby showers and also for sports themed parties. Because this is easy, I will have limited instructions. Feel free to ask any questions. Simply fold each corner of the tissue square into the cup. Do not move the cotton balls. You want them to stay in place. You do not need to tape the paper because we have treats to hold that paper still. Once you have tucked each corner into the cup, add a few treats to the cup. I chose to use M&Ms because this project is for a brown and blue baby shower. Now you can tie a ribbon or string around your little booty and you are complete! Check out more of T’s Tips About Everything!